Gadgets give us an easier way to find recipes, joke with friends, and kill time on the subway, but they can also have a much grander impact on our lives. This holiday season, we’re stepping back to appreciate those moments. In our ongoing series, Tech That Changed Us, DT writers will share personal tales of how tech has truly reshaped their lives for the better. We hope it has for you, too. I’ve never paid much attention to music. The impact on my life has always been small … until Vocaloid. I never had a personal “soundtrack,” like many people talk about. Growing up, I rarely purchased CDs, didn’t (and still don’t) use Spotify, and thought most popular songs, regardless of genre, were irritating and distracting. It wasn’t for want of trying, either. I went to classical concerts to see if that was my thing. They were impressive, moving, and enjoyable. But I forgot them the second I left the venue. I haven’t tuned the radio to any station in any car I’ve owned since I was about 20. It’s not that I was a joyless philistine, I just never connected with music in the same way I did with movies and books. And technology. Technology has never been just a job for me, it’s a passion. Knowing that, it shouldn’t surprising anyone that tech eventually helped me find music I truly love. “It’s awful,” my friend said, wrinkling his nose as he watched a music video clip on my phone. “But look how much fun the audience is having,” I laughed. He wasn’t amused, and asked for it to stop. I looked down as I closed the app, ashamed. I didn’t think it was awful. It was unlike anything I’d seen or heard before, and I couldn’t stop thinking about it. The video was this live recording of Hatsune Miku singing Supercell’s World is Mine, played to a packed audience of glow stick waving fans, all singing along to the words. It popped up in my Twitter feed some days before, likely as a jokey example of Japanese eccentricity. At first, I was fascinated by the tech. To me, at that time at least, I was witnessing a singing hologram — a virtual entertainer right out of science fiction, and a glimpse of an astonishing future world. I needed to find out more. For the uninitiated, Hatsune Miku is a Vocaloid, a voice synthesis software package for musicians to produce songs using technology from Yamaha, and it has been around since 2003. When I first heard about it, I spent hours reading about Vocaloid, initially fooling myself it was professional curiosity; but all the time falling more in love with the concept of Hatsune Miku, the fandom surrounding her, and more surprisingly for me, the music itself. The technology is crazy. When we think about computers “speaking” it’s usually in a monotone and soulless way. When Hatsune Miku sings, there is emotion, feeling, and a digital beating heart. She doesn’t exist, but the people who created Miku and the songs she sings are real, and it’s their passion we feel. You build your song using the Vocaloid editing platform, which is surprisingly simple to use, yet incredibly powerful, provided you have some degree of musical understanding. With a melody and some lyrics, the Vocaloid will perform your song, and you can craft his or her voice exactly to your liking. You can lengthen notes, add vibrato effects, alter the pitch, and even use alternative voice banks to change the overall tone of the voice. A Vocaloid can do things a human singer can’t. Miku, in particular, can reach incredibly high notes without losing her characteristic cute tone, or sacrificing range through the rest of the scale. Grappling the technology is the easy part. Injecting feeling takes talent. The other element that gives Miku, and the other Vocaloids, virtual life, is the actor whose voice is synthesized in the first place. Hatsune Miku is voiced by Fujita Saki, but she’s not the only one. In an illuminating Facebook post, Asakawa Yuu, who voices the Vocaloid Megurine Luka, described a recording session where she guided Fujita Saki, who does not speak English, through recording a recent update to Miku’s English voice bank. This perfectly encapsulates what’s so fascinating about the technology. Hatsune Miku’s voice was first digitized at least 10 years ago, but the significance wouldn’t become apparent for some time. Today, as artificial intelligence becomes ever more present in mainstream technology — from Siri and Alexa to autonomous cars and life-like robots — the concept of breathing life into a piece of software, and a virtual representation of that voice, is something we’re going to encounter more often. Vocaloid helped start this revolution. Hatsune Miku’s appeal is heightened because she’s more than just some code and a voice. Artist Kei Garou’s wonderful original character was animated to perform live on stage. Crushingly, Hatsune Miku isn’t an actual hologram, she’s a 3D model created by multiple, and very expensive, projectors beaming her image onto a super wide angle screen. The technology is rarely discussed, but on many occasions a Dilad screen has been used. This rear projection system has a special multilayered screen to give Miku her characteristic bright, 3D look, while avoiding light shining through and ruining the effect. Vocaloids are evidence that people can connect, on a personal and emotional level, with something constructed only from light and code. Whether you’re into technology, science fiction, or both; that’s incredibly exciting, and a little frightening. On August 31, 2013, a few weeks after I first discovered Hatsune Miku and showed that first video to my friend, I paid to watch a rare live stream of Magical Mirai, the annual Vocaloid concert held in Japan. This was really the first time I felt compelled to listen to music for pleasure. 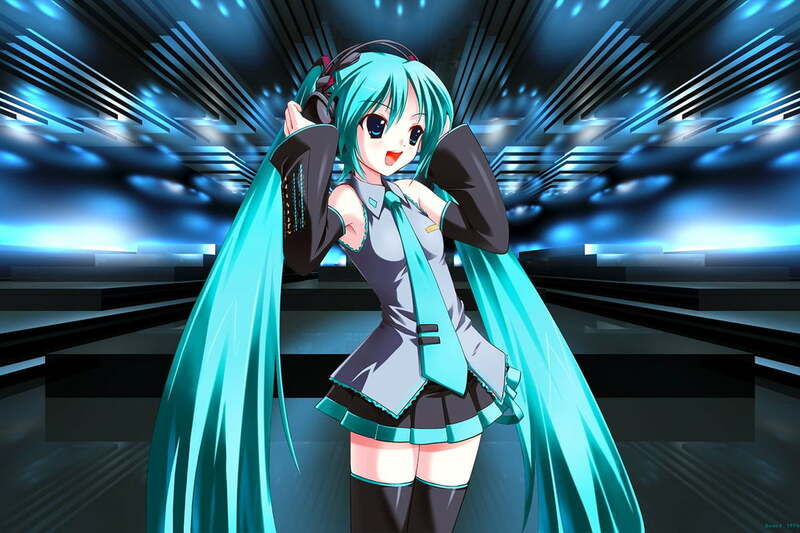 A lot of online searching soon revealed Hatsune Miku sung a lot of different musical genres, and her voice could be tuned in unique ways by different producers. This was really the first time I felt compelled to listen to music for pleasure. Those early days of discovering Hatsune Miku’s music are defined by three songs. The epic, beautifully constructed trance masterpiece Reverberations by Clean Tears, Aura Qualic’s angelic Pagasa, one of the first songs I heard where Miku seemed to actually breathe, and Mitchie M’s Believe. His ability to make Miku sound truly real is staggering. Remember, we’re talking about artists entirely using technology and their own talent to create incredible music and visuals here. To many, feeling this way about songs may sound familiar, or even normal. For me, it was entirely abnormal. I’d never cared about music in this way before, but the feeling snowballed. I now own a massive music library, go to live Hatsune Miku performances, and even attended a talk given by Hiroyuki Ito, CEO of Crypton Future Media, where he spoke about Miku and the creation of Vocaloid. Miku’s influence on me goes beyond Vocaloid. She prompted me to learn Japanese, and to visit Japan for the first time. She also indirectly introduced me to Japanese pop music and idols, another musical genre I now adore. That has led me to attend my first ever real life concert (featuring real life people playing real life instruments), buy way too many CDs, and develop an unhealthy obsession with headphones. If I never saw that video of a singing hologram, none of these things would have happened. Without Hatsune Miku and the musical world of Vocaloid, my life would be as it was before: Rather quiet.